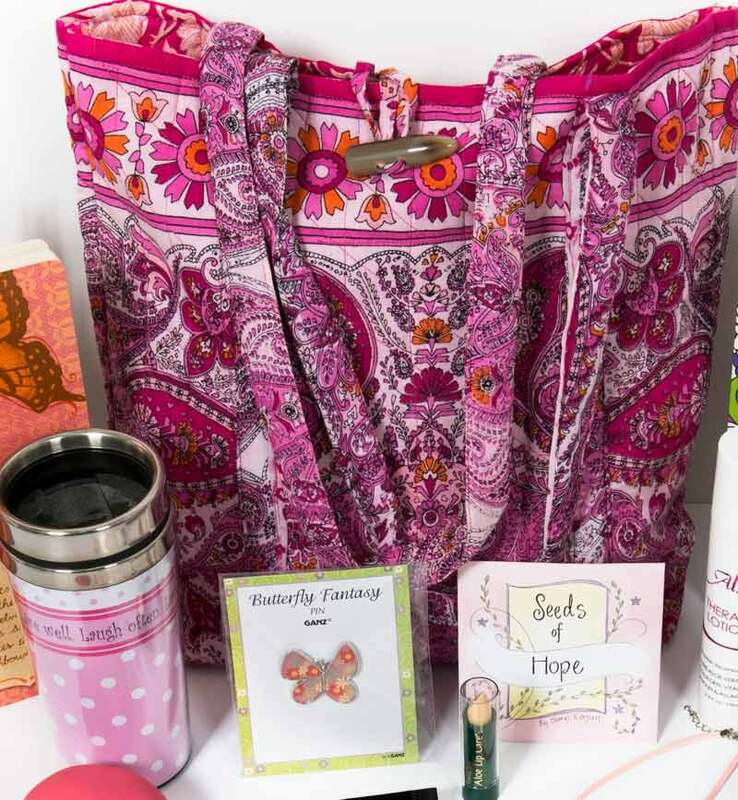 A chemo care package is a gift package to prepare yourself or a loved one with the essentials during treatments. We've included some of our favorite items. Woodblock printed fabric tote bag - Perfect for taking along crafts, iPad, coloring books, etc. in waiting room or during chemo treatments. Butterfly broach pin - Beautiful colorful pin can be worn on the lapel, used to secure head scarves or decorate headwear. "Seeds of Hope" inspirational messages - Contains inspirational messages of encouragement in the packet. Woodblock printed head scarf with scrunchie - Coordinates with tote bag. Can be tied in many different ways on the head; the scrunchie makes it easy! 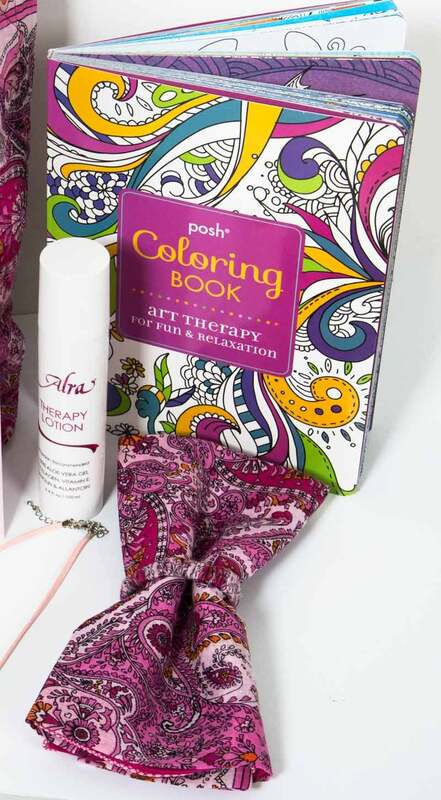 Alra Therapy Lotion for chemo & radiation care - Our top recommended cream for soothing dry, irritated skin during chemo or radiation treatments. Scent free and nourishing. Natural aloe lip balm - (Natural formula that is ideal for soothing dry, cracked lips during chemo treatments. 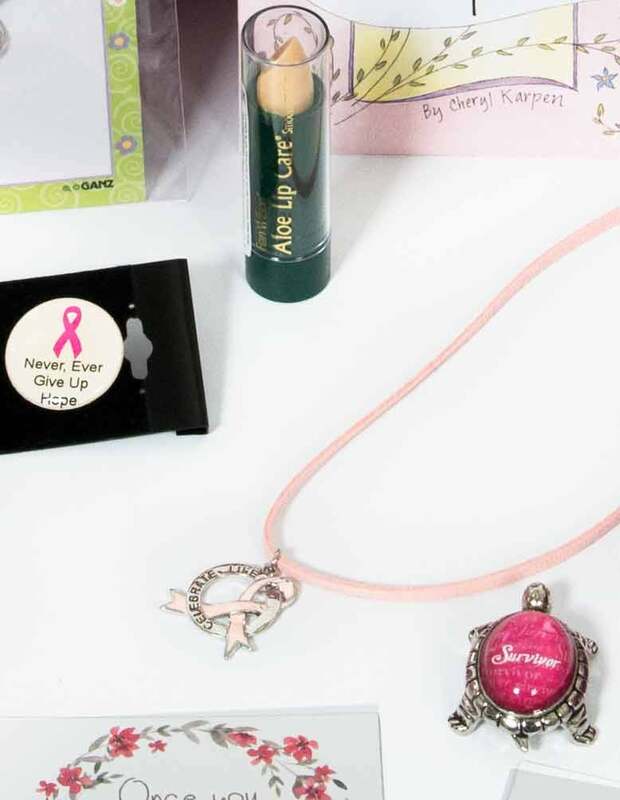 Breast cancer survivor necklace - Says "Celebrate Life" and comes with a ribbon cord. Breast cancer survivor turtle "good luck" token - Adorable pocket token turtle with the word "Survivor" on its back. Inspirational breast cancer support button - Button has a pink ribbon and says "Never Give Up Hope". Inspirational butterfly journal - Document feelings, keep up with appointments, writing therapy. 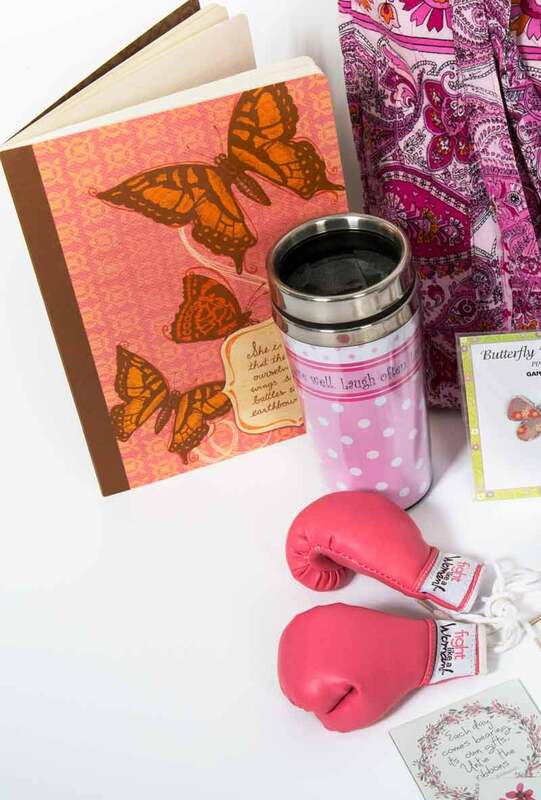 Autographable breast cancer awareness boxing gloves to "fight like a girl" - Add words of encouragement with a Sharpie. "Live, Love, Laugh" Insulated Travel Coffee Mug - We suggest adding your favorite herbal tea! 5 inspirational magnets - Enjoy 5 different inspirational magnets to put on your refrigerator, filing cabinet or any magnetic surface. 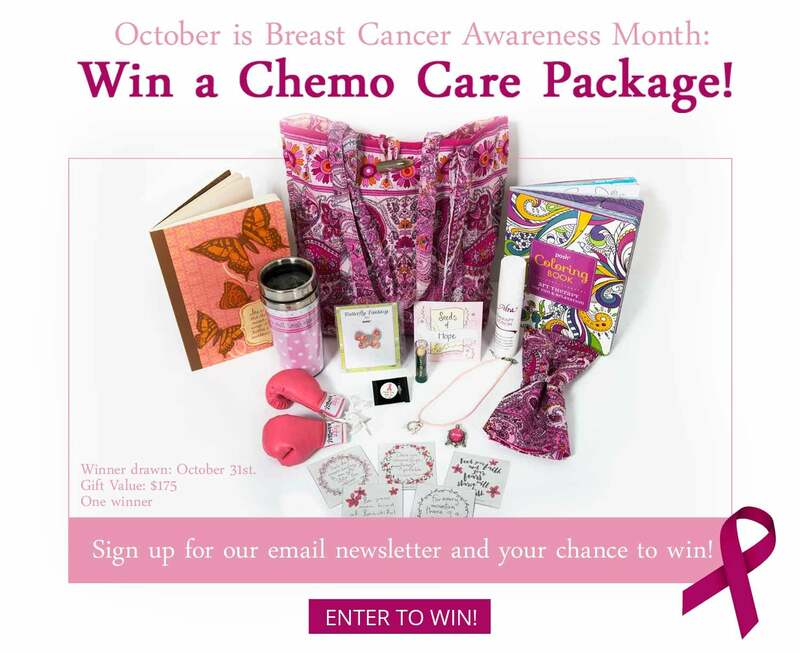 Sign up for our newsletter to win this chemo care package!